1. Heat oven to 180°C/160°C fan/gas 4. Grease and line a 1.2-litre loaf tin with baking parchment. Mix together the flour, baking powder, xylitol and lemon zest in a large bowl. 2. Mix the eggs, sunflower oil, milk and yoghurt together in a separate bowl or jug, and stir the wet mix into the flour mixture. 3. Spoon the cake mix into a tin and smooth the surface. Transfer to the oven immediately, bake on the middle shelf for 1 hour to 1 hour and 10 minutes. Check after 50 minutes – if the cake is becoming too dark, cover loosely with foil. 4. Just before the end of cooking time, make the drizzle by heating the lemon juice and xylitol in a small bowl. Stir over a low heat until the xylitol has dissolved. 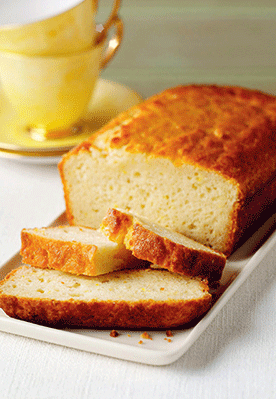 Once the cake is cooked, take it out of the oven and pour over the drizzle.